When you think of a typical refreshments table at a social function, what ‘s the first thing that comes to your mind? A spread of deli sandwiches. The veggie platter of broccoli, carrots, cauliflower and carrots. A cheese and crackers plate. The water and coffee carafes. Or, maybe you guys are like me and immediately think of the plate of assorted cookies. Most assorted cookie platters will have the usual suspects: chocolate chip, macadamia nut, and oatmeal raisin. Some have M and M’s and sugar cookies, but most just stick with the first three. It could just be my personal observation, but to me the ranking of the cookie platter is pretty clear and cut dry and there’s usually a pretty standard pattern that’ll I’ll see happen no matter where I’m at or the crowd I’m in. Chocolate chip cookies always trump everything. They disappear off the cookie platter the quickest so if you’re not one of the first or middle people in line, chances are, you just won’t get one. Macadamia nut cookies usually rank second. Most people are pretty fine with them, and there are even some people who like them best. Why do people like macadamia nut cookies? I’m sure I don’t know. Personally, I think they’re overrated. Also,I don’t like macadamia nuts. Moving on. Then there’s the oatmeal raisin cookies. They’re usually the ones that get eaten last, or just get completely passed over and left behind. 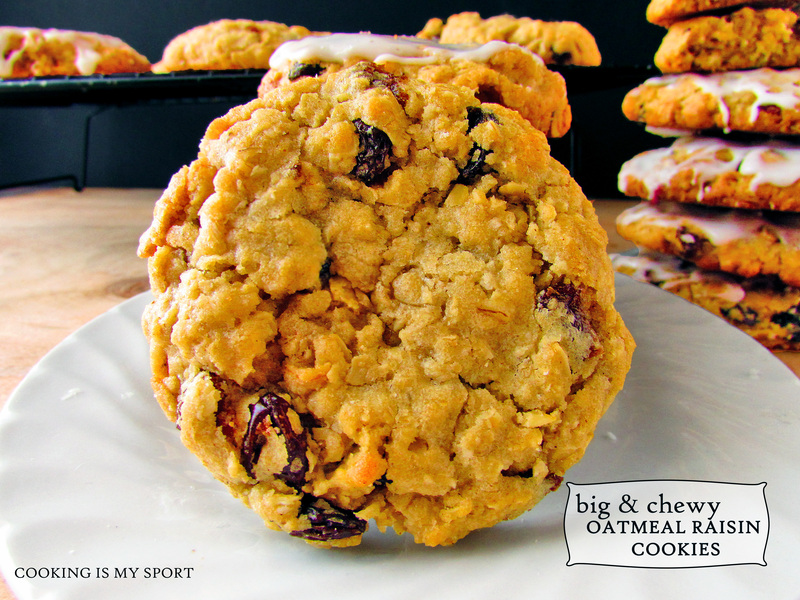 Most people I know HATE oatmeal raisin cookies. They’re like, the ugly step sisters of the cookie platter. This is a complete mystery to me. Personally, I love oatmeal raisin cookies. In fact, I’ll go a step further and admit that I learned to love oatmeal raisin cookies BEFORE I ‘learned’ to love chocolate chip cookies. Given the choice over the two, would always pick the oatmeal raisin first. It’s true. I’m just weird like that. I think that most people who don’t like oatmeal raisin cookies just haven’t had an oatmeal raisin cookie made for them correctly. The contrasting textures alone are enough to sell me; I love the coarseness of the oats set against the smoothness of the dough. The raisins almost seem to perfume the entire cookie so that even when you don’t bite into one specifically, you can still taste that sweetness that they leave behind. When eaten warm and soft, a perfect oatmeal raisin cookie alllllllmost even tastes like it’s healthy. Y’know before remembering all the butter and sugar in it that are making it so perfectly soft and chewy in the first place. Out of the blue, Jas announced one day that she had a craving for a certain iced oatmeal cookie that used to be sold in the stores when we were little girls that we absolutely LOVED. Those cookies sadly aren’t available anymore, but I thought I’d try to make some that were close to the originals. I used a recipe from America’s Test Kitchen, then adopted my die-hard habit of chilling my dough overnight. Once the cookies were done, I whipped together a quick powdered sugar icing that I drizzled over the top. Not to brag or anything, but these oatmeal raisin cookies would definitely be the stars of any cookie platter at a social event- yes, even with chocolate chip and macadamia nut cookies already there. Whisk the flour, salt, baking powder and nutmeg together in a medium bowl; set aside. In a stand mixer fitted with the paddle attachment, cream butters and sugars together at medium speed until light and fluffy. Add eggs, one at a time and mix until combined. Decrease the speed to low and slowly add the dry ingredients until combined, about 30 seconds. 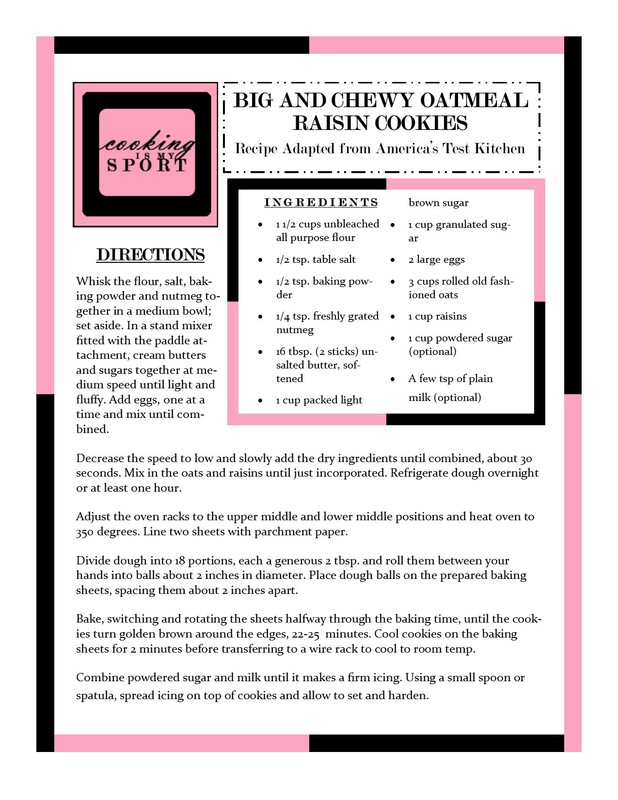 Mix in the oats and raisins until just incorporated. Refrigerate dough overnight or at least one hour. Adjust the oven racks to the upper middle and lower middle positions and heat oven to 350 degrees. Line two sheets with parchment paper. Divide dough into 18 portions, each a generous 2 tbsp. and roll them between your hands into balls about 2 inches in diameter. Place dough balls on the prepared baking sheets, spacing them about 2 inches apart. Bake, switching and rotating the sheets halfway through the baking time, until the cookies turn golden brown around the edges, 22-25 minutes. Cool cookies on the baking sheets for 2 minutes before transferring to a wire rack to cool to room temp. Combine powdered sugar and milk until it makes a firm icing. Using a small spoon or spatula, spread icing on top of cookies and allow to set and harden. These are my favorite cookies! I love the soft chewy kind too. I used to take them to my Dad and that gave me an excuse to make them. No one else likes them so I haven’t had one since my dad passed. Your cookies look amazing and I will be pinning for the next opportunity to make them! 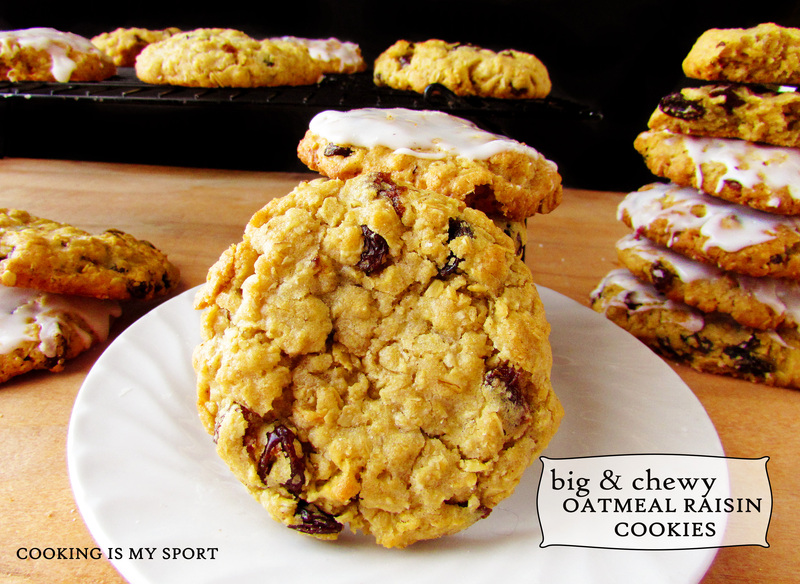 I love big chewy cookies–these sound great! Thanks Nancy, I liked how they turned out a lot! Lovely! 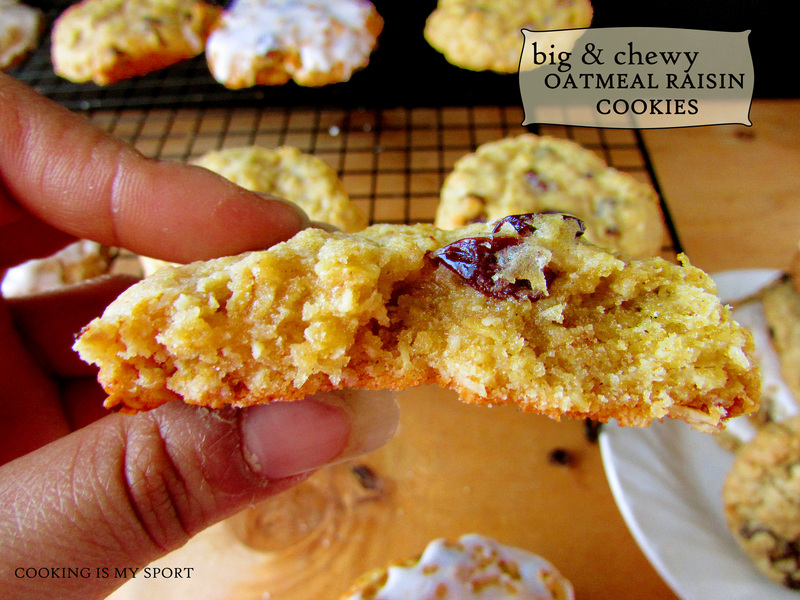 Chewy cookies have always been my preference over the crunchy kind, and yours looks amazing! So.. Here’s the scoop. I’ve tried numerous recipes for oatmeal cookies, always with zero luck. My husband and my daughter Jess both love oatmeal cookies, and I’ve let them down time and time again.. I will be trying these. Maybe as soon as this weekend if I have the ingredients on hand! 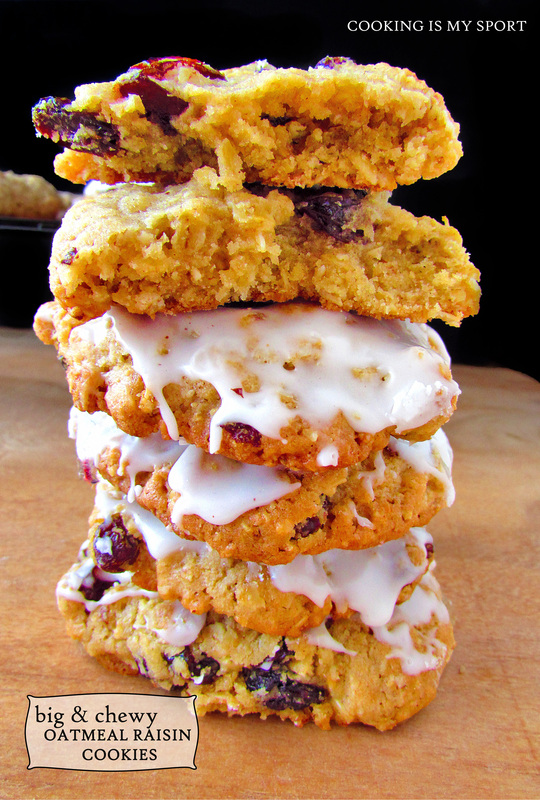 wow, simply damn delicious cookies..
lovin raisin all the way…. 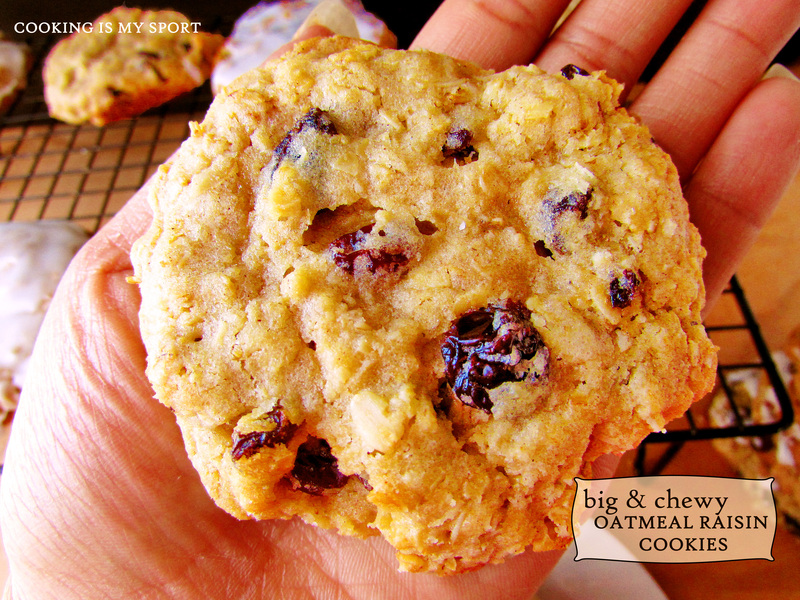 Mmmm I love a good chewy cinnamon raisin cookie! They’re my dad’s favorite, and would be mine, except I can’t choose one cookie over all the rest. You’ve got some great recipes here!